"See How They Run"opens January 25 at Savannah Community Theatre. 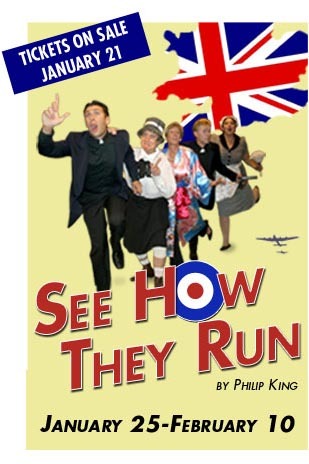 "See How They Run", the classic English comedy by Philip King,has just been added to our schedule! Characters gallop in and out of the four doors of the living room in the local Vicarage where chaos ensues. Set in 1943, the rollicking ride of a plot involves a cockney maid who has seen too many movies, the parish snoop who likes her sherry, an escaped prisoner who disguises himself as vicar, and mistaken identity of the clerical kind. Directed by J. Tom Coleman III. With Reneé DeRossett, Brian Farr, Jeff Hall, Robert Hooe, Anthony Paderewski, Tom Paris, Jordyn Schafer, Kim Schneider and Richard Seng. Tickets go on sale January 21. Call (912) 898-9021 or buy tickets online. Friday and Saturday evenings: 7:30 p.m.
Don't miss this laugh riot of a good time! For more info, visit Savannah Community Theatre.